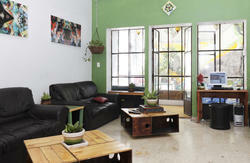 We're a new hostel located a few block from the downtown of Guadalajara. We're a fresh concept for those who like to travel in an approachable and friendly way. Perfect for those artists looking for a place to express and show their art work. A place for new proposals and events.